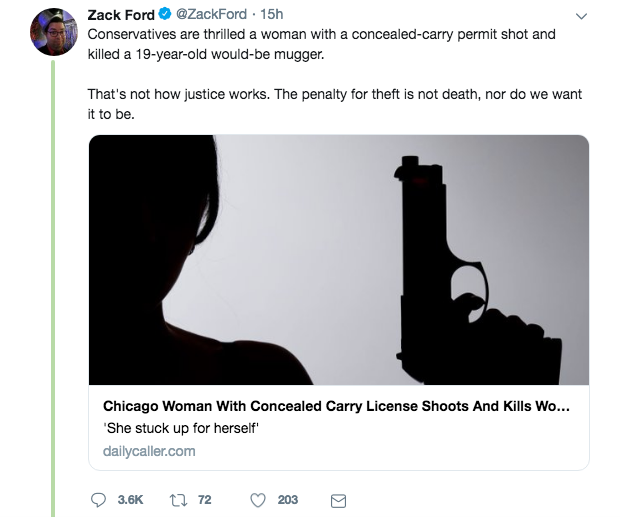 The Twitter ratio du jour comes to us courtesy of ThinkProgress reporter Zack Ford. The tweet is now deleted, but when I took a screenshot it was sitting at whopping 50 Ioffes. I will note now that Ford apologized in a multi-tweet thread. I want to breakdown his initial tweets anyway, and not because it means mocking a liberal, or because I have a daily post quota. Those are only, like, 90 percent of my motivation for this blog post. The other reason is that as with most Bad Tweets, I think the mindset and line of thinking that led to the the tweet is more instructive than the final product. There is a whiff of a hint of a glimmer of truth to Ford's tweet. The law generally requires that the use of self-defense be reasonable and proportionate. There are cases where the use of lethal self-defense are highly questionable and you can be charged with murder or manslaughter. Few of us think that armed citizens should go around gunning down pickpockets, for example. But what Ford left out is that the mugger himself was armed with a handgun. I suspect this omission was intentional, because that small fact utterly destroys his case. 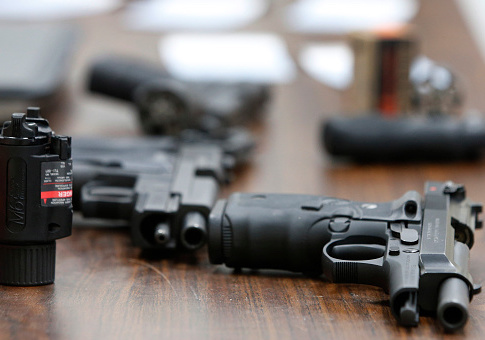 Armed robbery is not merely "theft," it comes with a threat of violence and harm. When guns are involved, that threat is implicitly murder. What we actually have is a case where a woman responded to a credible threat of violence with a proportionate amount of violence. I don't know that I am "thrilled" that one human being was forced to kill another. But yes, I call that justice. There's a lot going on here, so I'll take them in order. "The kid was 19" is almost a contradiction in terms: 19-year-olds are legally adults. An adult walked around at night, with a gun, robbing women. This is the same infantilizing nonsense that is rightly called out by Ford and his allies when used to excuse crimes from privileged white college students and "good ol' boys." It's "a gun death is a gun death" where you start to see how ideology is driving Ford's stance. Guns, you see, are bad. It's so alien to Ford's worldview that a gun might've have been used in good way that even something as straightforward as self-defense must be cast as a bad outcome. The fact that there was an actual human being in danger is besides the point when there's a cause to defend. Again, we get "the punishment for armed robbery is not death." But self-defense is not a matter of "punishment." Self-defense is justified because every person has a right to life, and with that comes the right to use the appropriate use of force to protect that right. That another person is harmed through the use of force is a predictable effect of self-defense, but the intention is the protection of life. Depending on the circumstances you may view the harm to an attacker as "punishment" they "deserved," but that's irrelevant to the larger moral justification. That's why self-defense is justified even against those we wouldn't think of as morally culpable, such as the mentally incompetent or insane. 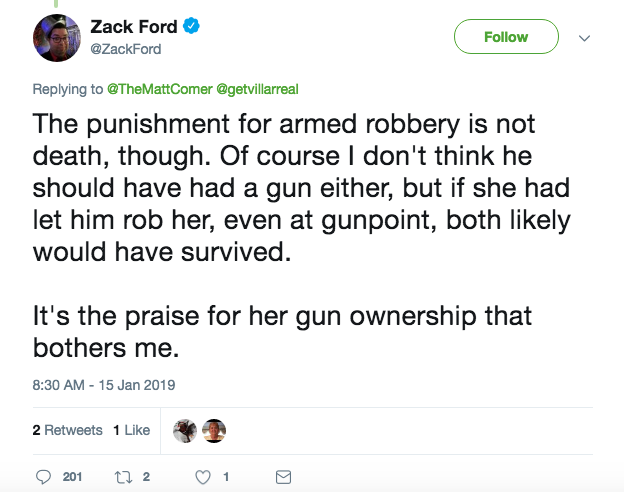 We now arrive at "if she had let him rob her, even at gunpoint, both likely would have survived." I … I almost don't know what to say here. I didn't expect Ford to be so blatant as to say that the woman should have just let someone rob her, but there it is. For all the talk on the left of privilege checking, there's a shocking lack of recognition from Ford that a young woman being approached by an armed man at night might recognize that there's a chance the encounter won't end in just robbery. Ford brings things full circle by noting that to him, this all gets back to gun ownership. Most gun opponents are perfectly capable of understanding that gun ownership sometimes leads to good results, even if they believe the number of bad results outweigh those benefits. Ford couldn't even bring himself to acknowledge that anything good could spring from an object he despises. Again, Ford deserves credit for deleting the tweets and backtracking. But it shouldn't take a near legendary ratio to spark that revelation. This entry was posted in Politics and tagged Gun Control, Guns, ThinkProgress. Bookmark the permalink.